It is commonly known that the average litter box needs to be scooped out on a daily basis, once or twice, alongside a weekly full-scale cleaning with new litter. Of course, if you are like many people, you may be cursed with a forgetful nature leading to a cat-owner’s (or at least their house-guests’) worst fear: a smelly home. For others, the constant stooping and scooping can be physically demanding, not to mention time-consuming. Wouldn’t it be great if there was a litter box that was not only simple to use, but would automatically clean itself? The PetSafe ScoopFree Self Cleaning Litter Box is just what the forgetful cat owner ordered. While other self-cleaning litter boxes may require a button, a lever or other action to start it on scooping its litter, the PetSafe ScoopFree Self Cleaning Litter Box requires very little interaction. Plug the litter box into a nearby outlet, place a special crystal litter tray into the device and leave it be for a few weeks. The litter box will be able to sense when a cat uses it, and will then wait for 20 minutes before automatically raking the crystals into a special waste bin. Cleaning the litter box is as simple as replacing the disposable tray every few weeks. This is the entire reason anyone will get the PetSafe ScoopFree Self Cleaning Litter Box. This litter box fortunately requires little care. As a matter of fact, messing with the litter too much can be counter productive and cause the litter to smell. With this self-cleaning litter box, you really can just plug it in and let it sit, while cleaning it just requires throwing away a disposable litter tray. We’re really excited by the heat-based sensor system built into this scoop-free litter box. A fear that many cat owners may have with self-cleaning boxes like this is that the cat will be scared off by the noises it makes when it cleans, making your cat’s potty a source of anxiety. The PetSafe ScoopFree Self Cleaning Litter Box gets around the concern of scaring away cats through its automatic 20 minute wait before the cleaning is activated. The box won’t start raking the waste until it is sure that your cat has finished its duty. At first, your cats may be drawn to the raking, either finding it as a source of curious fun or a thing of terror, but it won’t happen while they are in it and it won’t prevent them from using the box. PetSafe’s crystals seem to be of a high quality. Your cats’ urine drops to the bottom of the tray where the moisture and smells are absorbed by the crystals. These crystals do a great job handling urine while the rake does its work on the solid waste. The crystals provided in the trays are less prone to tracking than with traditional litter. You won’t find yourself walking on litter with these, and if a little bit does get outside of the box, the blue coloring of the crystals makes it easy to spot and to clean up quickly. Another advantage that the crystals have over clay-based litters, and the fact that these crystals are already loaded into the tray, is that you won’t have to worry about dust at all. No more face fulls of litter dust! The PetSafe ScoopFree Self Cleaning Litter Box does not come with a cover, but if you or your cat prefer having a cover over the litter box, there is an additional cover that is sold separately by PetSafe. Perhaps you feel that the litter tray is too shallow? Well, you can buy a deeper Forever Litter Tray. This tray also has the advantage of not being disposable and can save you money. You can also change the litter used in the Forever Litter Tray in case your cat has sensitive paws. The disposable litter trays may be convenient, but will need to be changed every 2 weeks to a month, depending on your cat and the number of cats that you have. Each tray costs $50, which means that this can add up to spending $50-100 per month on litter, a lot more than what you would spend on average clay litter. 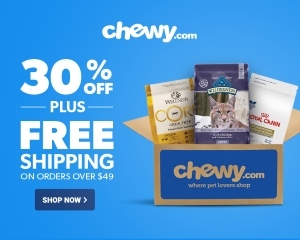 However, it is important to note that the Forever Tray will cut these costs down to about $20 per month, a price that is a lot more reasonable for most cat owners. We think this is well worth having to clean out the tray once a month rather than disposing of it completely. Crystals are much sharper and harder on a cat’s feet than clay-based litters. Some cats have sensitive paws, while others just don’t like the crystals. This can lead to difficulties with getting your cat to adjust to the crystal litter, and if it’s painful your cat, then this litter box just won’t be a good fit for you. On top of the possible discomfort for some cats, crystals are much more difficult for cats to dig into, and if they do dig into it, they might release some of the scents that are found at the bottom. The crystals work great on the top of the tray, but those crystals at the bottom, where the urine is being absorbed, can get pretty nasty. If your cat starts digging into the crystals, or if you mistakenly do a little raking of your own, you might find yourself releasing quite an unpleasant stench into your home. A deeper tray would help keep those reeking crystals away from the top, and will allow your cat more comfortable digging opportunities. 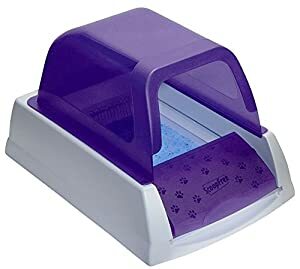 Unfortunately, the PetSafe ScoopFree Self Cleaning Litter Box’s disposable trays are quite shallow, which might lead to an unhappy cat if you’ve got a digger on your hands. When it comes to maintenance, the PetSafe ScoopFree Self Cleaning Litter Box is one of the easiest ones we can find. As stated above, you plug it in, and you leave it. The disposable litter trays are meant to last for an entire month, but if you have multiple cats you will find that it lasts a much shorter time period. It’s important to note that with the included crystals, the box should not be kept in humid areas, such as the bathroom, as the crystals will absorb the humidity in the air, shortening their lifespan. Also, if your cat is prone to belly problems and has not-so-firm stools, this could cause a problem with the raking mechanism where they will stick to the rakes or even possibly be spread throughout the box instead of being scooped easily into the disposal area. This is definitely something to consider when looking into any self-cleaning litter box. When newly purchased, it will likely take a week or two to acclimate your cat to the new box and to the new litter. It is recommended that you add the cat’s current litter in with the crystals at first, and then slowly lowering the ratio of old litter to new litter. If the old litter is a clumping litter, you should not turn on the automated self-cleaning features, as this type of litter would stick to the rake and lead to quite the mess. Instead, wait until your cat has successfully accepted the new litter. You should keep the old litter box around at first too, which will help in avoiding stress for your cat. The PetSafe ScoopFree Self Cleaning Litter Box comes with a one-year, non-transferable warranty. When it comes to a litter box that you can just put down and forget, the PetSafe ScoopFree Self-Cleaning Litter Box is a great choice. Coupled with the Forever Litter Tray, it is also an easily affordable choice compared to much of the competition that you will find on the market with similar litter boxes. The important thing to consider when it comes to a litter box that is somewhat different from the average non-self-cleaning litter box is that each cat will react to it differently. As any cat owner will tell you, cat personalities and behaviors can vary wildly from cat to cat. Fortunately, the PetSafe ScoopFree Self-Cleaning Litter Box seems to work well with most cats, only really bothering those cats that have sensitive paws or the ones who are not fond of digging in the crystals when they could dig in traditional litter. Still, with its easy customization, most concerns that someone might have can be waylaid, making for an excellent device that will keep your home scent-free, and cat-care worry free. And as with anything, sometimes making a big change in one of your cat’s items that they frequently use just takes some getting used to. All in all, the PetSafe is worth a shot.